I've always been taken with Audio Ease's rather insanely brilliant Altiverb. Not so much for its cathedrals and emulations of expensive reverb units, although they are stunning, but more because somebody also decided to chuck in the reverb from the back of a Ford Transit van as well, and the inside of a washing machine and a vacuum cleaner pipe. The last two are particularly poignant for me, as I spent a good portion of my childhood years delightedly amplifying my yells and Metal Mickey impersonations through items such as these, much to the irritation of my parents. So it was already with a smile and a warm heart that I took delivery of the latest addition to the Audio Ease family, Speakerphone. It's available in all the major native plug-in formats on both Mac and PC, and can be authorised either via iLok or challenge and response. For those unfamiliar with the principles of convolution, both Altiverb and Speakerphone are based upon the application of impulse responses. These are very precise snapshots of the acoustic characteristics of an environment, surface or object, which are captured and rendered, for want of a better word, into digital recordings that can be used to effect whatever signal you choose. This means you can have Salisbury Cathedral as your reverb chamber should you wish, or the inside of a jam jar, and the results are astoundingly realistic. However, convolution can be applied to any linear system — not just reverbs — and Speakerphone uses mainly impulse responses of a wide variety of loudspeakers as its point of sonic focus. 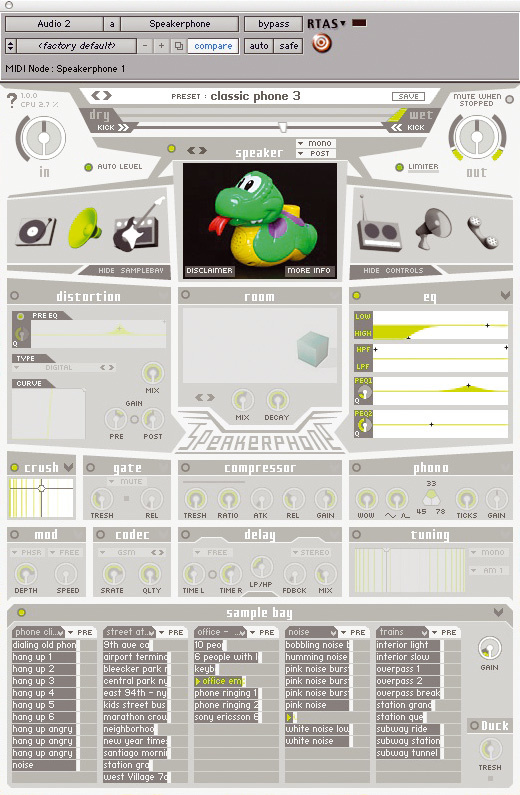 It allows you to recreate anything from a megaphone to a mobile phone, and everything in between. There are literally hundreds of speaker emulations to choose from, ranging from '50s gramophone horns to '70s TV sets, computer speakers, children's toys, headphones and walkie-talkies, all the way to the car stereo from a Renault Megane. And let's not forget the comprehensive set of guitar cabinets that come with Speakerphone. In here you'll find a veritable who's who of rock & roll from over the years including Fender, Gibson, Vox, Ampeg and so on, all generated using a variety of mic positions and mic types. Simply plug in your guitar, adopt the rock pose of your choice and turn it up to 14 (11 is soooo last century). As well as speakers, a variety of post-production oriented acoustic spaces are also included.As well as the speakers themselves, there is also a comprehensive effects section to help further alter your sound using tools such as distortion, delay, bit-crushing, EQ and compression. Then, to top it all off, you get what effectively amounts to a sampler thrown in for good measure. In fact, you get five samplers, albeit rather simplistic ones. Speakerphone comes with a host of useful sounds to add realism to your speaker setup of choice, including phone clicks, static, dial tones, atmospheres, radio frequency sweeps, nature sounds, scenarios, people sounds and drones. 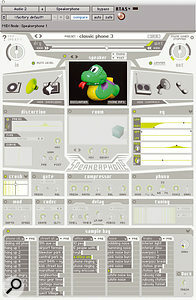 There's even a selection of royalty-free music tracks to incorporate into your sonic creations. Simply stick one through one of the Walkman headphone impulse responses, add a train carriage atmos in the background, bung on a few mobile phone ringtones and suddenly you're back on the 7.19 from Surbiton this morning with the stinky hungover bloke who sat next to you with his iPod on full blast, fell asleep and dribbled all over your copy of Sound On Sound. What's more, it's possible to drag and drop these sounds directly into your Pro Tools Session as audio tracks, should you wish to mangle them a bit, and rather coolly, you can then simply drag 'em back to the sample bay and carry on, or even add your own. Lastly, as if all that wasn't already enough, you can then soak the whole lot in some Altiverb-based reverbs. My personal favourites currently are the cockpit of a Mig fighter(!) and a living room with the sound, now very muffled and bass-heavy, emanating through the ceiling from the upstairs bedroom, something anyone with teenage kids will know very well. Everything is easily accessible from the front panel, which is rather large, but folds itself away into a slightly more manageable size with a click of the mouse, and, all in all, Speakerphone really does do what it says on the tin. It's probably not the done thing as a reviewer to admit I haven't quite got around to reading the manual yet, but to be honest, everything is so gasping obvious and well laid-out that I never felt I needed to. You can literally load it up and be off in seconds. Brilliant. The most obvious use for Speakerphone is as a post-production tool for TV, radio and film. It's almost laughably easy to take your own voice, stick it through a Tannoy system and put yourself in the heart of a main-line railway station during rush hour making a station announcement, complete with opening 'ding dong' and subsequent total lack of clarity. Similarly, you can just as quickly be on the other end of a car phone whilst driving down the motorway (hands free, obviously, Constable) or even on top of a mountain calling base camp via walkie-talkie whilst being ever so slightly out of range, with all the digital dropouts that entails. However, Speakerphone can also be put to good use in music production. Perhaps you need a quiet verse vocal or a special effect on a guitar part, or maybe you want your track to open up as if it's being played on a little transistor radio before kicking in properly? I actually bought this copy that I'm reviewing just as I was working on a big jingle package for a radio station. The brief was for lots of sound design on the vocals, such as static, extreme EQ and as many different interesting ways to harass vocals as I could muster. Needless to say, Speakerphone was absolutely tailor-made for the job, came up trumps every single time and saved me at least a day's toil that would normally been spent trying to come up with interesting vocal effects under my own steam. I can't praise it highly enough — it's quirky, original, easy to use and deeply inspirational. Perhaps most important of all, it's a whole Mig cockpit full of fun. Incredibly versatile and useful for a variety of applications. Did I mention brilliant fun? You have to stop mucking about with it and do some real work every now and then! Speakerphone is a must-have for post-production professionals, but has plenty of uses in music production as well.